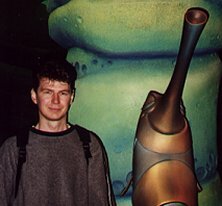 I couldn't wait any longer to visit Mermaid Lagoon, so that's where we headed next. The outside is stunning! 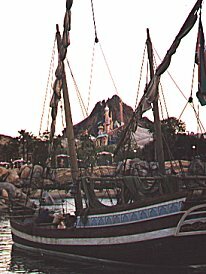 The picture shows a view from the Arabian Coast of Mermaid Lagoon with Mt. Prometheus in the background. Mermaid Lagoon is built to look like King Triton's castle. Soft pastel colours are used to make the structure look like coral sparkling in the sun. There are two rides outside the castle, Flounder's Flying Fish Coaster and Scuttle's Scooters, but everything else is inside. 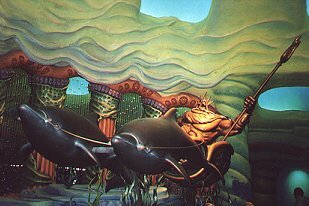 When you enter, you are greeted by a large statue of King Triton in his chariot, pulled along by dolphins. The lighting is also dimmed to create the impression that you are now under the water in the land of the merpeople. As you make your way down to the floor of the lagoon, an absolutely amazing site greets you. 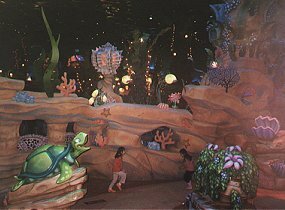 The whole area is very well themed with coral, various sea creatures and water effects. There is even silver streaks on the ceiling to create the effect that you are under water. One of the first areas you notice as you come down is a children's water playground set amongst the coral. Various creatures like turtles spurt water from their mouths periodically while the children try not to get wet (or in some cases, they try to get very wet). You will find a wide range of attractions on the ocean floor. 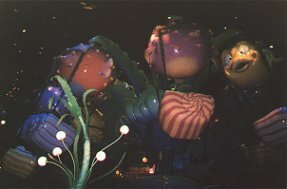 These include the Jumpin' Jellyfish, the Blowfish Balloon Race, and the Whirlpool (which is based on the teacup ride at Disneyland). Each continue on with the same ocean theming. We didn't actually go on any of the attractions at this stage (the lines were too long) but did walk around the Sleepy Whale Shoppe and Ariel's' Playground. Ariel's Playground was a lot of fun. It is built with the kids in mind, but it was still interested for us, supposed adults, to walk around. Large Sea-snails mark the entrance. Once you enter, there are overhead bridges to walk around which give you a good view of the area and the many fishes 'swimming' around. There is also a sunken ship to explore...but beware of the sharks. :) Ariel's Grotto has been included in the area. 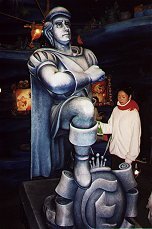 It is decorated with lots of human nick naks as well as a large statue of Prince Eric. 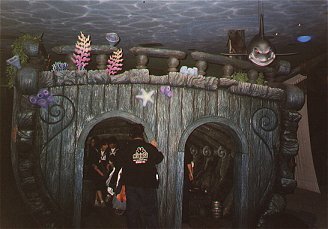 If you look up to the roof of the grotto, you will see the King Triton statue that greeted you when you first entered Mermaid Lagoon. 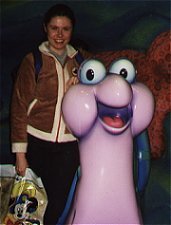 We were also very fortunate with our timing as the crazy chef from the Little Mermaid movie happened to be walking around while we were there.